Workers installed a logo outside Mercedes-Benz Stadium. 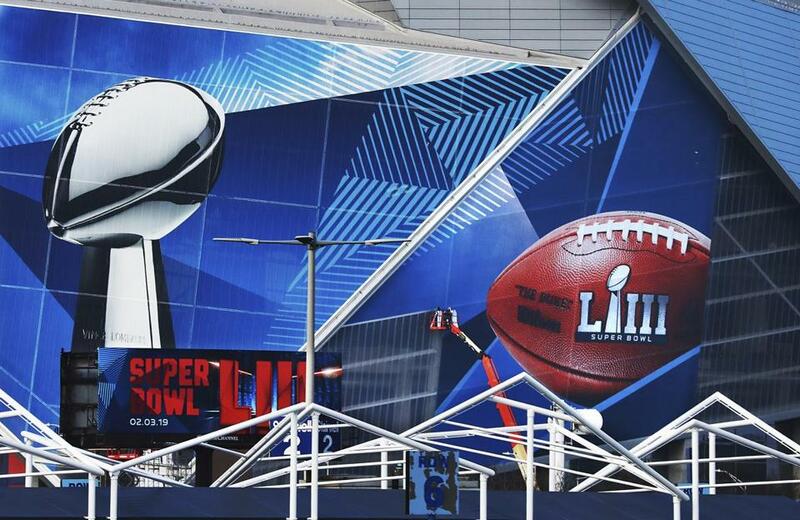 Tickets to the Super Bowl might not be as expensive as they could have been. As of Wednesday, the average ticket price for the Feb. 3 game at Mercedes-Benz Stadium in Atlanta was $7,000, and the cheapest ticket was $2,800 (for a seat in the upper end zone), according to TicketIQ.com. The website also noted that the quantity of tickets available on the secondary market was at a three-year high. On Wednesday morning, prices on NFL Ticket Exchange ranged from $3,250 (for a seat in the upper corner of the stadium) to as much as $30,000 (which includes pregame hospitality and a great view of the field). On Ace Ticket’s website, prices were starting as low as $2,947 for a ticket in the upper level of the end zone “and go as high as $6,500 or more for some of the very best,” Ace Ticket spokesman Ryan Kelley said. The most expensive seating option listed on Ace Ticket’s website Wednesday was priced at $249,000. That $249,000 price tag would cover the cost of admission for a group of 26 people (or approximately $9,576 per person), Kelley said. So what makes the expensive seats so special? Those ticket holders also get access to premium club lounges before, during, and after the game, Kelley said.